Even with all this painstaking attention to accuracy, Eighty Eight Ensemble 2 provides plenty of opportunities to customize the sound to match the project—or your taste. The four-band EQ allows the timbre of the sound to be easily refined. An improved limiter offers enhanced dynamic control. Even the level of the sustain pedal and hammer release elements that help define the character of the piano can be individually controlled. Eighty Eight Ensemble 2 also adds a new robust reverb section. The high-frequency damping and room size parameters can add just the right ambience to your performance. 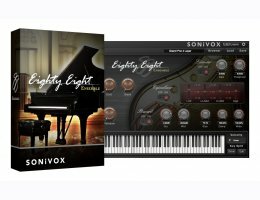 As the name implies, there is more to Eighty Eight Ensemble 2 than piano. Combination patches come in two flavors. Layered combinations, or Pads, add a second instrument that sounds along with the piano. These layered sounds include strings, synth pads, and choral pads. Split Combinations, or Combis, introduce a second sound—or even a third—played in a specified range of keys. Setting a lower split adds a bass sound—such as bass guitar—playing below the piano. Setting an upper split adds a solo accompaniment instrument playing above the piano. Solo sounds include flute, clarinet, acoustic guitar, etc. Combis can have both an upper and lower split. The zones, or range of keys where each instrument will play, can abut or overlap as you desire. The velocity response can be set to make the most of your keyboard and playing style.